Labor has won a clear majority in yesterday's election - counting of postal votes is still likely to decide a couple of seats that are in doubt, but it looks like the new Prime Minister Mr Rudd will have 86 or 88 seats, giving a majority of around 11. It turned out that Labor won more seats in QLD than I had expected yesterday evening, and the Liberals didn't win any seats from Labor in WA. 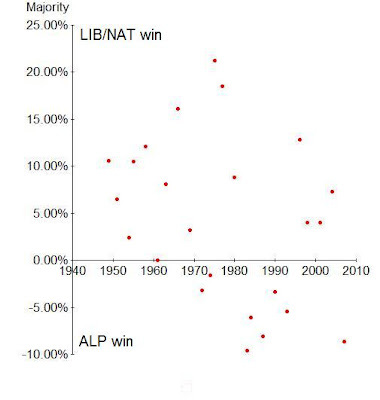 A plot of majority (as a percentage of total seats) for all post-war Australian elections is quite interesting. As you can see below, yesterday's result is the best Labor has had since the first win by Bob Hawke back in the early 80's. It's big enough that Labor is likely to have at least two terms in office, which probably explains why Mr Costello has decided not to contest the leadership of the Liberal party. As I've said previously, the policies announced during the election campaign were fairly mild. It will be interesting to see what surprises may turn up in the first Labor budget next May. Labor appealed to the green voter more than the Liberals, with promises to ratify "Kyoto" and be more pro-active about setting 'aspirational' greenhouse gas emission targets. It will be interesting to see how this pans out in the longer term, as Australia is largely dependent on coal-fired power stations and exports a lot of coal. Labor has a reasonably strong anti-nuclear policy, which means that Australia won't be getting any nuclear power generation capacity in the foreseeable future. However, their policy to not expand on uranium production for export may conflict with the increase in the use of nuclear power in SE Asian countries and China. It will also be interesting to see how Prime Minister Rudd handles the withdrawal of combat troops from Iraq next year, while leaving anout 2/3 of the troops there for embassy security and "support" roles. The ALP is also going to keep the Australian tropps in Afghanistan, which may become the next foci of anti-war protestors in Australia. In recent weeks there have been several Australian servicemen killed in Afghanistan, and the latest fire-fight seems to have also killed some Afghan civilians. Next election we could see the "No War" protestors targetting the ALP, just as in the UK.